The Toyota Corolla is known as one of the top-selling cars in the world. When you drive it, you’ll instantly see why. Since the 1960s, it has proven itself to be dependable, comfortable, and astoundingly affordable. While it still carries a humble price tag, it delivers above and beyond on value with reliability and excellent gas mileage. The 2019 Corolla is available as both a sedan and a hatchback, with some unique characteristics spread across trims. The sedan now comes standard with the lauded Toyota Safety Sense P, and the new hatchback is equipped with Toyota’s latest safety tech suite, the cutting-edge Toyota Safety Sense 2.0. The SE was designed for fun excursions, equipped with a Sport driving mode, sleek interior styling, and available with six-speed manual transmission. While all Corollas come with outstanding safety technology, the upper trims offer some fine comfort features like leather upholstery and heated front seats in the XSE, or the proximity key entry and moonroof of the XLE. Whether you plan to cruise through the streets of Sycamore or DeKalb or hit the open roads of Illinois, the 2019 Corolla is ready for you here at Toyota of DeKalb. Come by our dealership and take it out for a test drive today! The 2019 Corolla can seat five in both the sedan and hatchback builds. There’s no shortage of legroom, and the new hatchback’s quality materials have delighted drivers over long trips. The sedan’s trunk provides 12 cubic feet of cargo space, and when the hatchback’s rear seats are folded down, it offers 23.3 cubic feet of storage. Car seats may be anchored with two sets of lower LATCH connectors. In the Sedan, power comes courtesy of 1.8-liter 4-cylnder engine that produces 132-horsepower in the standard build, and 140 horsepower in the LE Eco trim. This comes paired with your choice of an automatic continuously variable transmission or a six-speed manual transmission. The hatchback comes with a 168-horsepower 2.0-liter 4-cylinder with either the manual or automatic transmission. The Corolla navigates streets and highways with ease thanks to a finely-tuned suspension, and the brakes are reliably responsive. Its fuel efficiency has earned high praise among drivers, especially the hatchback when equipped with the CVT. 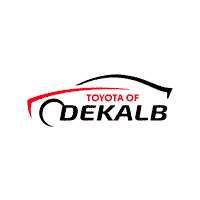 At Toyota of DeKalb, you’re certain to find the vehicle you’ve been searching for, and our new and used Toyotas encompass a wide range of models, trims, and price points. Our inventory is available online for your convenience, and you’re always welcome to come by the dealership to explore our selection in-person. Whether you’re in the market for an affordable compact car or any other value-packed Toyota, our staff will be ready to answer your questions. When you’re ready to make your decision, we’ll also go over financing options to make a good deal even better.